Explore exotic Morocco, dining in an authentic riad, navigating Marrakech by horse-drawn carriage, sitting down to a meal with a local family and meeting the Berber people in their village beneath the Atlas' peaks. Explore the towering Hassan II Mosque, a wildly intricate building that holds 25,000 worshipers; an additional 80,000 can be accommodated in the squares around it. Soaring above the ocean, its minaret stands as the tallest religious structure in the world. Drive to Rabat, the capital of Morocco, and explore the 12th-century Moorish Hassan Tower. 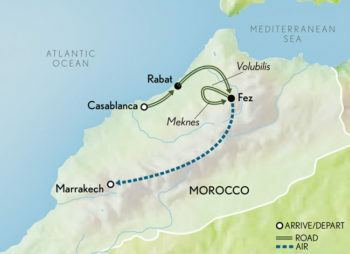 View the mausoleum of Mohamed V, founder of modern Morocco, and visit Oudaya Kasbah; its gate is considered among the most beautiful in the Moorish world. Continue to Fes, arriving at day’s end at your boutique hotel set on a scenic hilltop. Step back in time into ancient and remarkably untouched Fezel-Bali (“Old Fes”), the cultural heart of Morocco. Wander among the 9,000 lanes, alleys and souks that comprise its old quarter, where locals conduct their day-to-day business. See an elaborate mosaic-tiled fountain in Nejjarine Square. Later, discover Fezel-Jadid (“New Fes”), built in the 13th century. Fezel-Jadid is home to the Mellah, the old Jewish quarter, with its wrought-iron-decorated windows and carved wood balconies. Tonight, dine at a traditional Moroccan riad with a special guest who shares insight into Moroccan life. After breakfast, drive to Volubilis, a UNESCO World Heritage Site and home to Morocco’s largest and best-preserved Roman ruins with excellently preserved mosaics. Continue to the city of Meknes. A UNESCO World Heritage Site and one of the imperial cities of Morocco, it was built in the 17th century by the powerful sultan Moulay Ismail to rival the court of Louis XIV. Return to Fes to enjoy your evening at leisure. Fly to Marrakech, arriving in the afternoon. Considered the “Pearl of the South,” Marrakech was once the capital of an empire that stretched from Spain to Senegal, and is sometimes known as the “Red City” for the distinctive hues of its brick buildings. Discover Marrakech’s ancient medina, the old walled section of the city. Explore the Dar Si Said (Museum of Moroccan Arts), a former palace. Continue to El Badi Palace and the 12th-century Koutoubia Minaret, the most perfect Islamic religious structure in North Africa. Stroll through Djemaa el-Fna square where fire-eaters, mime artists and street musicians perform. Return to your hotel by private horse-drawn carriage. This evening, enjoy a unique dining experience when you share a dinner with a local family.